Step 1 Soak the cashews in a bowl of filtered water for at least 6 hours or overnight. Step 2 Drain and rinse the cashews under fresh water. Step 4 Add the probiotics** and blend again until just combined. Step 5 Put the mixture into a sterilised glass jar and cover with a small amount of olive oil (just enough to cover completely). Close jar securely with lid. Step 7 After 48 hours pour the olive oil out and store the fridge. Step 8 Enjoy as a delicious dip or spread. * You may need to add more water to achieve this as all blenders/food processors are different. I use a Vitamix and find this is enough for me but add more if you need to. ** I recommend using a quality probiotic that has been prescribed by a health practitioner. If this isn’t an option for you then Inner Health Plus is a trusted over-the-counter brand you can get at most pharmacies and health food stores. ***After 24 hours lightly open the lid and screw it back on in order to release any gas that may have formed. 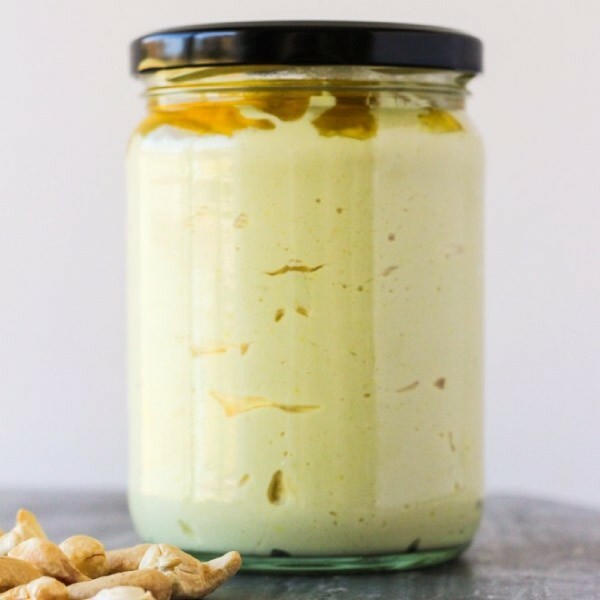 This Cultured Cashew "Cheese" is a simple to make vegan, fermented spread. It is dairy-free with a similar texture to cream cheese, making it a delicious accompaniment to many snacks or meals. Spread on sandwiches or wraps, use as a dip, or dollop on top of your poached eggs for brunch! Cultured Cashew Spread is packed full of nutritious goodness including probiotics to help promote gut health.